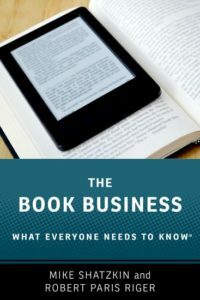 Ever since Amazon arrived in the “book business” 20 years ago, each year the “book business” has become less and less of a stand-alone industry. Of course, the only part that ever really was a stand-alone was the trade business, where the entire ecosystem: authors and their agents, publishers, booksellers, and even — for the most part — the printers lived in a world of mutual dependency but pretty much standing apart from what went on in the rest of the world. By the latter part of the first decade of this century, a Big Five CEO in the US delivered this observation to me. “I used to be able to get the CEO of my biggest accounts on the phone if there was something to discuss.” That was no longer possible with Amazon. And, in fact, if he could have gotten Jeff Bezos on the phone, there would have been very little to talk about. When we started Digital Book World in 2010, we were following closely in the footsteps of O’Reilly Media’s Tools of Change conference, which had established itself a few years before and shut down a year or two after we started. The F+W executives who had the vision for DBW thought ToC was not “practical”; they felt that it didn’t give book business attendees “actionable” takeaways. When we agreed to program a competing event, providing “actionable” programming was our prime objective. We achieved that, initially, by eschewing what we saw as the “cover the tech developments and the book business will figure out how to follow” mindset of ToC in favor of a focus on how digital was changing the world of trade publishing. Our intent has been to concentrate on what publishers need to do to adapt to the change. This year when we met with our Conference Council to plan the next DBW, they told us our business needed to hear more about the big tech companies. That reflected the reality the CEO observed nearly ten years ago. Our world is being shaped by the big tech companies. And that doesn’t just mean the obvious one, Amazon, which is almost every book publisher’s biggest trading partner. It means Facebook and Google, which have become perhaps our primary marketing mechanisms. And, of course, it also means Apple, which has become the second-leading ebook provider to Amazon. The point most emphatically made by all of this is that the book business is a cork floating on a digital device stream. We don’t control our environment. We must keep adapting to what bigger players, some of which have pretty minimal bandwidth to engage us in a dialogue and pretty minimal interest in what’s best from our point of view, see as the best strategy for them. Indeed, we have reached a point where every trade publisher needs a strategy for its company’s dealings with the tech giants. And the forces that might affect the growth, stability, or strategies of the big tech companies, including anti-competition actions by and within the European Union, now call for attention and understanding from publishers in the US who could be affected by these changes. Since the mission of Digital Book World remains to inform and educate book publishers about how digital change will affect them, we took the hint from our Council and have lined up a number of speakers for DBW 2016 who will shed light on the technology companies that are increasingly shaping the ecosystem in which we live. We intend to make DBW 2016 the indispensable conference for book people who recognize the need to understand the tech companies we interact with every single day. We’re really proud to be featuring SEO expert, blogger, and Moz founder, Rand Fishkin, at a book publishing conference for the first time. Search Engine Optimization is the single most important new skill publishers are learning to market their books effectively in the digital environment. And Moz is the single most important tool for Search Engine Optimization. Fishkin arguably knows more about the science of search, local, and mobile marketing than anybody else on the planet. He will deliver a talk from the main stage about what everybody needs to know about search now and then he will also be available for a 50-minute Q&A session in a breakout. Scott Galloway is a Clinical Professor of Marketing at NYU Stern School of Business where he teaches Brand Strategy and Digital Marketing. One of his primary interests is tracking the biggest tech companies. His talk on the “Four Horsemen” (Amazon, Apple, Facebook, and Google) demonstrates the depth of his understanding. We were really pleased to find an academic who has made a specialty of studying the four companies we identify as most influential in the environment publishers must operate in. At DBW, Galloway will talk about these companies with special attention to how their strategies and future growth will affect us in the book business. Jon Taplin is a Professor at the Annenberg School at the University of Southern California. He is a veteran of the music and movie businesses, having produced concerts for Bob Dylan and The Band and more than a dozen movies, including “Mean Streets” and “The Last Waltz”. He also has stints as an investment banker and a founder of the first Internet video on demand service in the 1990s. Taplin sees the tech-centric and libertarian Silicon Valley values having gradually taken control of the revenues for content away from content creators, a point of view he spells out in a video called “Sleeping Through A Revolution”. In his talk at Digital Book World, Taplin will explain how tech took control away from content creators and spell out what he thinks the content community can do to fight back and start getting paid more fairly for the quality content that he believes drives the success of many tech companies on the Internet. Virginia Heffernan is a journalist who writes frequently at Medium and in the New York Times Magazine on the intersection of content and technology. Her next book, coming from Simon & Schuster in June, is called “Magic and Loss: The Internet as Art”. Heffernan sees the Internet as a large collective art project. She will look at how the Internet and digital technologies have changed our fundamental relationship with content. Heffernan reminds us that the Grateful Dead probably began our reordering of thinking about how content creators can benefit commercially from their work, being the inventors of the idea of “giving away” the music (encouraging their fans to go ahead and record their concerts and share the tapes), making up for any lost revenue from sales of recordings by selling concert tickets and branded chotchkes. Heffernan will also explore the impact of ebooks on how people read and the value of books as branding assets and calling cards for professionals and experts. Jonathan Kanter is an antitrust attorney at Cadwalader, Wickersham & Taft and co-head of the firm’s technology group. Jonathan represents both tech companies and content providers. He is totally familiar with the business models of the major tech companies, including Amazon, Apple, Facebook, and Google. This includes both the benefits they provide and concerns that some of these companies use their position in the market to distort competition to the detriment of content providers. At DBW, Kanter will focus on how book publishers interact with the big tech platforms. He will explain the current antitrust actions pending against big tech companies and the potential impact on US-based book publishers. We’ve also asked Kanter to talk about what remedies might be applicable here in the longer term to preserve the important services that big tech companies offer to consumers while at the same time protecting the rights and businesses of content creators. Could the government impose rigorous but intelligent remedies that address concerns without destroying the value that these tech companies create? Kanter will spell out how things could get worse for the content industries if there are no controls and explore how government agencies could use enforcement action or regulation. And we’re working on more. There are anti-monopoly legal actions taking place in Europe against the both Amazon and Google. While Kanter will include those in his analysis, we are also talking to our European friends, looking for the right person to bring us a report from the front on these as well. Until the last two decades — starting with the arrival of Amazon — book publishing only had to understand itself to plot its strategy. That has changed. Without real knowledge of how the tech world is changing its ecosystem and engaging book-readers with other choices for their information and entertainment, highly-predictable changes will be very surprising. Digital Book World 2016 aims to help publishers build that understanding as the next stage of the digital transition unfolds. Register now for Digital Book World 2016, taking place March 7-9, 2016 at The New York Hilton.